AUTOMOTIVE LINT FREE WIPES • "POLYSOFT WIPES"
Very soft cloth, non-abrasive, will not scratch. You can run a taxi fleet or own a line of luxury cars – but it’s not going to work unless the right impression is created. Nobody is going to appreciate a taxi ride or rent a luxury vehicle if the car is poorly presented and unclean. All automobile fleet operators instinctively know the value of maintaining and presenting spotlessly clean vehicles, which enhance the customer experience and reinforce the quality of a corporate brand. Cleanliness may or may not be next to godliness, but it sure is right next to profitability when it comes to running a fleet of vehicles! So stash a pack of POLYSOFT automotive lint-free wipes in the glove box, providing a quick cleaning solution to the driver when looking for something handy to pull out and polish the interior (or exterior) of the vehicle, or remove dust or grime off a surface. Being lint-free, these cloths will not leave behind any lint or fibre after use, making them ideal for cleaning windscreens, mirrors, dashboards and instruments, even leather fittings. They will also quickly absorb spills. POLYSOFT automotive lint-free wipes are manufactured from long lasting, strong and tear resistant polyester, resulting in a delicate soft cleaning cloth, which at the same time is strong enough to wipe off tricky grease stains or withstand harsh automotive cleaning chemicals. 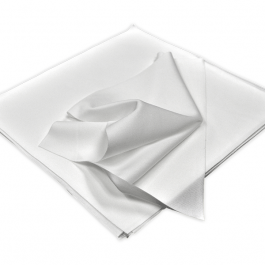 The heavy and high density structure of the soft polyester fabric makes them perfect valeting wipes. These soft detailing polishing cloths can also be used on glass windows and windscreens to remove every speck of dust. So, if you're looking for a lint-free polishing cloth to maintain a spotless and shining car, van, bus, truck, taxi, boat or camper – don't travel without a pack of POLYSOFT low lint automotive wipes! Other related products from TIDDOX 's range of automotive cleaning cloths include the SOLVENT RESISTANT WIPES , the RHINO BOX OF PULL-OUT WIPERS, and the LOW LINT INDUSTRO WIPES.